Nollywood film marketer, Olajide Oluwaseun Kazeem, alias Seun Egbede and his accomplice, Oyekan Ayomide, were, yesterday, rearraigned before a Federal High Court sitting in Lagos. Meanwhile, the prosecution also informed the court that it was bringing all 36 Bureau De Change operators allegedly defrauded by Kazeem, Ayomide to give evidence against them. Egbegbe and Ayomide, were first arraigned before the court on February 10, 2017, for defrauding the BDC Operators of the sum of N39, 098, 100: $90,000; and £12,550. The accused persons were alleged to have between 2016 and 2017, swindling the 36 BDC operators of various sums both in local and foreign currencies. Egbegbe and Ayomide had, pleaded not guilty and Justice Oluremi Oguntoyinbo had on February 24 granted each of them a bail of N5m, with two sureties, one of whom must be a Grade Level 16 Civil Servant in either Lagos or Federal establishment. At the resumed hearing in the matter, yesterday, the prosecutor, Mr. Innocent Anyigor, of the state Criminal Investigation and Intelligence Department, SCIID, Panti-Yaba, informed the court that the charge sheet had been amended and the counts increased from 36 to 40. He urged the court to allow the amended charges to be read to the accused for the purpose of re-taking their plea. 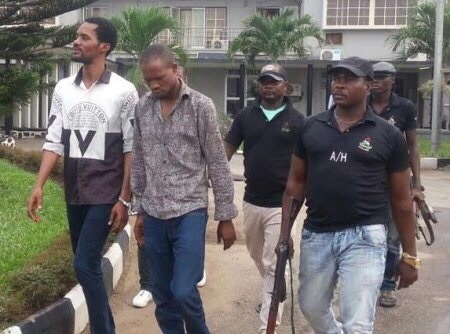 The judge granted the prayer and Egbegbe and Ayomide were re-arraigned and pleaded not guilty. Following the re-arraignment, the defence counsel, Mrs. A. Gbadamosi, urged the judge to vary the bail conditions granted Ayomide because he was only involved in three out of the 40 counts. In response, the judge, Justice Oguntoyinbo, said the prayer would be considered later. The prosecutor told the court that it has 30 witnesses in court and ready for commencement of trial. But the judge noted that the prosecution witnesses in court were the victims, who the defendants allegedly defrauded and not the investigating officers who investigated the case. She said that she preferred the IPOs to testify first before the BDC operators, on the grounds that the IPOs could be transferred out of Lagos anytime. She, therefore, adjourned till March 24, 2017 for commencement of trial.